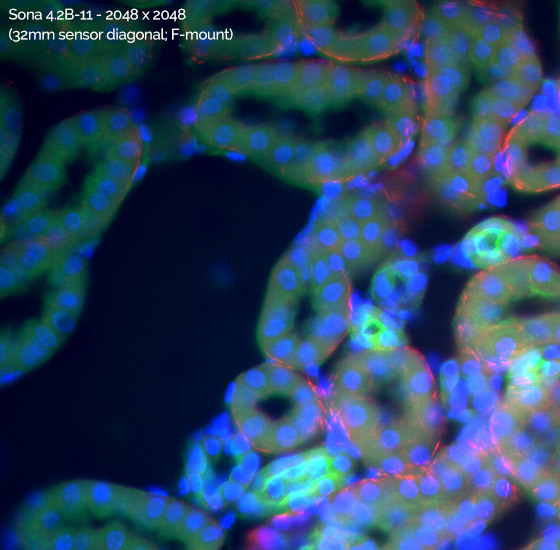 The flagship 4.2 Megapixel Sona 4.2B-11 model utilizes a unique technology approach that enables us to usefully access the entire 2048 x 2048 array, offering an impressive 32 mm sensor diagonal, harnessing the entire field of view available from the microscope. This is perfect for applications that require maximum information content, allowing large fields of cells, whole embryos or tissue samples to be captured with absolute clarity. Easily adaptable to 60x and 40x objectives - Combine with Magnifying Coupler Unit (MCU) - preserve optical clarity over a range of sample types. Vacuum Cooled to -45 °C - Very weak signals require lowest noise floor: Don’t be limited by camera thermal noise! The ONLY vacuum back-illuminated sCMOS - Andor's proprietary UltraVac™ technology protects the sensor from (a) QE degradation, and (b) moisture condensation. Anti-Glow Technology - Allows access to full 4.2 Megapixel array with long exposures – maximize field of view and sensitivity advantages. 48 fps (4.2 Megapixel); 70 fps (2.0 Megapixel) - Image highly dynamic samples without signal smear - e.g. cell motility, membrane dynamics, ion flux, blood flow. > 99.7% linearity - Market leading quantitative accuracy over the whole signal range – confidence of measurement in any application where signal intensity indicates local concentration. 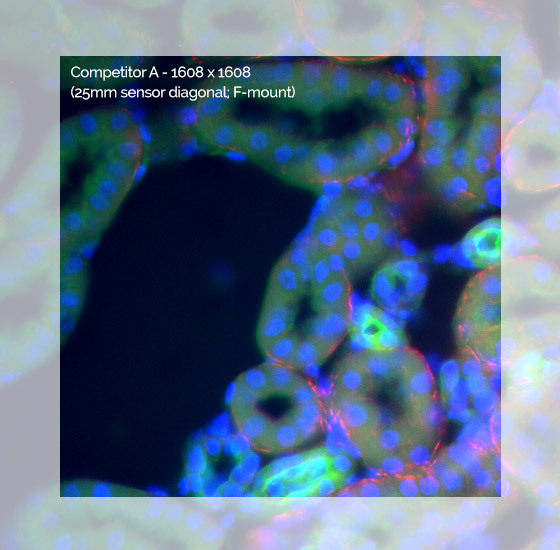 User configurable ROI - Adapt to a range of microscope port sizes. Push frame rates and save data storage space. Sona 4.2B-11 and Sona 2.0B-11 back-illuminated sCMOS models each feature 95% Quantum Efficiency (QE) and market-leading vacuum cooling to -45°C. The darkcurrent of GPixel sCMOS sensors is relatively high, compared to that of BAE/Fairchild Imaging sCMOS sensors that are utilized in Zyla and Neo sCMOS cameras. This places additional emphasis on the need to deep cool the sensor in order to suppress the noise floor, i.e. minimizing the camera detection limit. Due to the unique vacuum design, Sona thermoelectrically cools to -25°C using only the internal fan for heat dissipation. 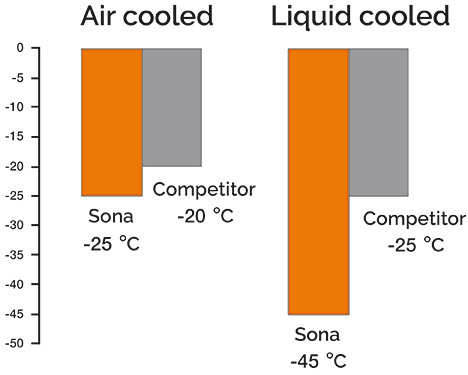 Furthermore, Sona can utilize liquid assisted cooling to push down to a hugely competitive -45°C! "Back-illuminated sensors are valued specifically for their enhanced sensitivity – it makes sense to choose the most sensitive adaption of this high-end technology." Better SNR with TIRF and confocal low light modalities - better image clarity with techniques that reject out of focus photons. The GSense400 back-illuminated sensor from GPixel is widely recognised to suffer from glow at the edges of the sensor. This glow manifests as false signal and is exposure dependent. To date, the effect has forced camera manufacturers to either limit the usable region of the sensor to an array size notably smaller than the native 2048 x 2048 full resolution, or alternatively to impose a severe 30 millisecond restriction on the maximum exposure length that is permitted by the camera. Either way this fundamentally restricts performance and usefulness across a range of applications, either through field of view limitation or through sensitivity limitation. Andor have studied and characterised this sensor issue in detail and have developed and implemented a unique anti-glow technology to tackle this problem. 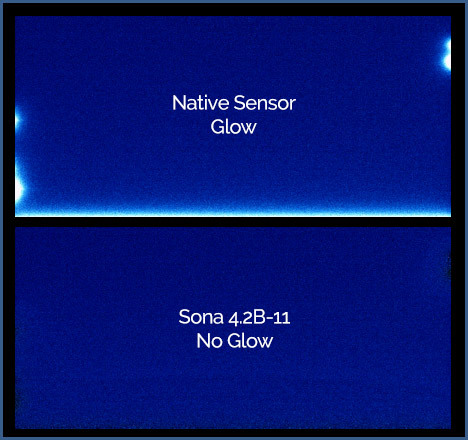 The figure below shows a dark image of the GSense 400 back-illuminated sensor with and without anti-glow technology – the difference it makes is stark and has enabled Andor to open up the full 2048 x2048 array, while also allowing exposure times up to 20 seconds. 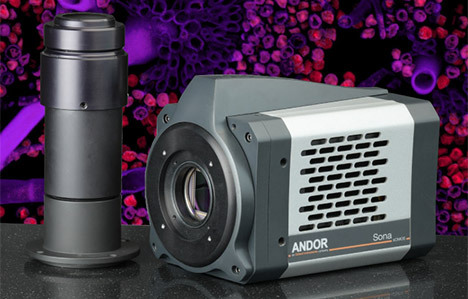 Andor provide an optional Magnifying Coupler Unit (MCU) accessory which can be used alongside the Sona 4.2B-11 in order to utilize the full field of view of this large sensor with several common types of modern research fluorescence microscopes. It can be used to adapt both Sona 4.2B-11 or Sona 2.0B-11 for use with 60x and 40x objectives, thus increasing the on-sample field of view while also maintain Nyquist resolving clarity. Since the image is being 2x magnified onto a 32 mm diameter sensor area, then the MCU can be attached to any port that offers an image output of 16 mm or greater. This describes the vast majority of available ports. The innovative Dual Amplifier architecture of sCMOS sensors uniquely circumvents the need to choose between high or low gain amplifiers, in that signal can be sampled simultaneously by both high gain (low noise) and low gain (high capacity) amplifiers. As such, the lowest noise of the sensor can be harnessed alongside the maximum well depth, affording widest possible dynamic range. Uniquely for such a relatively small pixel design, this allows for dynamic range performance of 53,000:1 in Sona. Furthermore, on-camera intelligence delivers a significant linearity advantage, providing unparalleled quantitative measurement accuracy of > 99.7% across the full dynamic range. This provides measurement confidence in any application where signal intensity indicates local concentration, e.g. ion flux, FRET and expression analysis. The Sona models are capable of delivering up to 70 fps, the data streaming to PC through a high-bandwidth USB 3.0 interface. This is ideal for fast applications such as cell motility, ion flux and blood flow imaging etc. Faster speeds still are available through Region of Interest (ROI) selection, scaling only with ROI height, i.e. a full width ROI provides the same frame rate as a reduced with ROI, as long as they share the same number of rows. This can be useful for imaging elongated samples at fast frame rates, such as measuring calcium flux in smooth muscle cells. The sCMOS sensors in Sona 4.2B-11 and Sona 2.0B-11-11 have highly parallel readout architecture, facilitating high data readout rates and therefore fast frame rates. All columns possess their own Amplifier and Analogue to Digital Converter (ADC), meaning that all columns are read out in parallel. The Sona 4.2B-11 and Sona 2.0B-11 cameras each utilize a Rolling Shutter exposure mechanism. Rolling shutter essentially means that different lines of the array are exposed at different times as the read out ‘wave’ sweeps through the sensor, a row at the bottom starting the exposure approximately 21 ms before rows at the sensor’s distal edge. The lowest readout noise and fastest frame rates are available from this mode. Rolling shutter only presents an issue when imaging relatively large, fast moving objects within the field. Then, aside from the risk of motion blur that can affect any imaging condition in which rate of motion is being temporally under-sampled, there is an additional possibility of rolling shutter spatial distortion. However, distortion is less likely when relatively small objects are moving at a rate that is being temporally oversampled by the frame rate, which in fact describes the vast majority of use cases. A further potential downside of rolling shutter is that different regions of the exposed image will not be precisely correlated in time to other regions, which can be essential for some applications. For example, if a cell is electrically stimulated and it is important to measure the onset of calcium sparks relative to the stimulation event, then rolling shutter should not be used. In this case, a true global shutter mode is required, available in Zyla 5.5 and Neo 5.5 sCMOS cameras. The Andor GPU Express library has been created to simplify and optimize data transfers from camera to a CUDA-enabled NVidia Graphical Processing Unit (GPU) card to facilitate accelerated GPU processing as part of the acquisition pipeline. GPU Express integrates easily with SDK3 for Andor sCMOS cameras, providing a user-friendly but powerful solution for management of high bandwidth data flow challenges; ideal for data intensive applications such as Light Sheet Microscopy, Super-Resolution Microscopy and Adaptive Optics. Superb, easily accessible documentation and examples. Andor’s Sona sCMOS camera comes equipped with an in-built FPGA filter that operates in real time to reduce the frequency of occurrence of high noise pixels. This real time filter corrects for pixels that would otherwise appear as spurious ‘salt and pepper’ noise spikes in the image. The appearance of such noisy pixels is analogous to the situation of Clock Induced Charge (CIC) noise spikes in EMCCD cameras, in that it is due to the fact that we have significantly reduced the noise in the bulk of the sensor that the remaining small percentage of spuriously high noise pixels can become an aesthetic issue. The filter employed dynamically identifies such high noise pixels and replaces them with the mean value of the neighbouring pixels.